Starting in September, CMP customers will see a new format for their electricity usage that can be adapted for variable pricing. For the first time in more than 20 years, Central Maine Power customers will receive bills next month with a new format, one that is designed to make it easier to compare their past and current electrical use. CMP says a bar-chart graphic looking back 24 months will help people who want to track their seasonal and annual energy consumption. 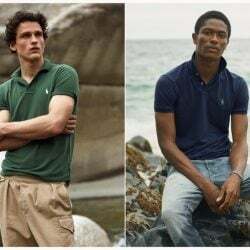 While the changes are modest, the redesign will eventually be integrated into what could be an extreme makeover in how customers are billed. A long-awaited technology upgrade for CMP’s billing system soon will let the utility charge customers different rates based on when they are using electricity. CMP replaced its old-style analog electric meters with digital units in 2009. The so-called smart meters are capable of uploading usage data from a home or business every 15 minutes. But the meters aren’t as smart as they could be. To make full use of their capacity, CMP first has to replace an old mainframe computer and build and test a new $52 million data management and billing system, called Customer SmartCare. Rice did not have a precise time line for when the system would be running, saying that it is still being tested and employees are being trained to run it. Avangrid, CMP’s parent company, estimated last winter that Customer SmartCare would be up by the end of this month, but deadlines for implementing the system have slipped for years. Eventually, electricity suppliers will be able to use the data captured from the meters to offer new rate packages to homes and businesses. 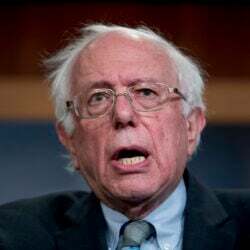 They could charge less money for power when demand is lower and wholesale prices are cheaper, and more money at peak hours, when prices on the electric grid spike. This practice is called dynamic pricing and it’s a growing strategy in other states and countries. It offers a way for customers to reduce their bills, if they can avoid using power when it’s most expensive. Avangrid expects to roll out an optional pilot program with dynamic pricing as early as next year, using smart meters now being installed in Ithaca, New York. Utilities there would increase prices during periods of high demand and lower them when demand is low, typically between 9 p.m. and 6 a.m. and on weekends. Home customers now pay the same rate, no matter when they flip the switch. The new CMP bills will simply provide a more up-to-date presentation of each month’s consumption. Hobbins believes the new bill format is more user friendly and could be helpful to customers. His office participated in a working group at the Public Utilities Commission that included utilities and energy suppliers. Its goal was to assure that CMP’s new billing system, in conjunction with smart meters, would provide an opportunity for competitive power suppliers to develop innovative products that could help consumers manage their electricity use. To that end, the new bill format hints at what’s to come. “This should be looked at as the beginning of a new consumer awareness, which will be further enhanced with smart meters,” Hobbins said. The smart meters had been opposed by some critics who believe the wireless technology the devices use to transmit the usage data threatens homeowners’ health and safety, but in January 2016 Maine’s Supreme Judicial Court affirmed a PUC ruling that found the meters are safe. 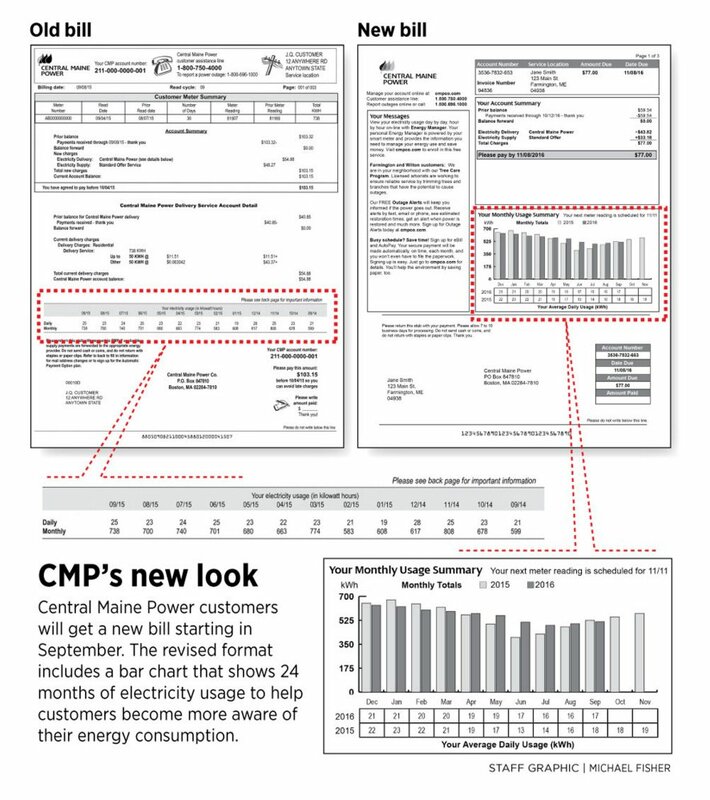 CMP’s bill design saw its last major change around 1999, to reflect Maine’s landmark law that restructured the power industry and restricted utilities from selling electricity. Bills were updated to break out the rate that customers pay CMP to deliver the power, and the price per kilowatt hour charged by the power provider. Today, more than a third of CMP’s 619,000 customers receive their bills electronically. They will see the same format changes as the printed bills that come in the mail. On the delivery page, the current bill has a table that shows daily and monthly power use over the past 12 months. The new bill also has the daily table, but includes a bar chart of usage over the past 24 months. A typical home bill might show a gradual slide from winter to summer and back up again, as consumption patterns change through the seasons. Rice also said the company talked with customers, surveyed employees and studied what other utilities were doing. Derek Davidson, who heads the PUC’s consumer assistance and safety division, said his agency doesn’t get much feedback about CMP’s bill format. But it does hear from people concerned about how much power they use. He had a positive reaction to the new bill. “Including the most recent and the prior year’s usage information in a bar chart for easy comparison is very helpful,” he said. This bar chart, though, is just a static representation of active information that’s already available to customers on the internet. Customers who sign up for Energy Manager can see their energy use daily, monthly or yearly, and compare it to similar homes. Based on their home’s profile, they can see an estimate of what’s using the most energy – hot water, lighting, heating and so on. More than 60,000 customers have signed up for Energy Manager. One thing that’s not available in the new format or online is a finer accounting of all the costs that make up a total bill. A typical home bill, for example, would show that standard offer electricity supply is 6.7 cents per kilowatt hour and CMP delivery is roughly 7 cents, for a total of 13.7 cents/kwh. But it omits any breakout of the elements that go into the delivery charge, which includes roughly 2.7 cents for transmission upgrades. That’s notable, because transmission costs have been the fastest growing part of a bill, rising as energy costs have fallen or moderated. Rice said CMP tested the idea of separating costs, but customers preferred a simpler presentation.